At the award-winning Dr Rita Rakus Clinic we offer an unrivalled range of the latest non-surgical face lifting treatments, including the ultimate High Intensity Focused Ultrasound (HIFU) treatment, ULTRAcel. Our innovative, non-invasive procedures lift, tone and tighten loose skin turning the clock back on your face and neck with NO knife and NO surgery. Contact the clinic now to book a free consultation with Dr Rakus and start your journey towards a more confident and younger looking you! "At the clinic we offer the best non-surgical face lift treatments available. In order for us to determine which of the many treatments we offer will give you the best results to know which treatment is best, I would suggest you book a free consultation with me at the clinic to discuss the different options for the results you desire." Our Ultimate non-surgical facelift , as featured in Tatler’s Beauty and Cosmetic surgery guide, combines three of Dr Rita’s most popular treatments. This three-pronged skin tightening treatment utilises the collaborative power of the Oxygen Facial, HydraFacial, UltraSound and Radiofrequency treatments for instant, pain free results and absolutely zero downtime. 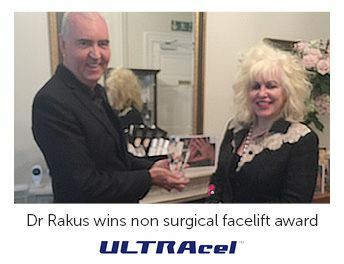 Dr Rakus was recently awarded the SmartMed Diamond Award for ULTRAcel. Ultherapy® is an FDA-cleared, non-invasive procedure that lifts and tightens the neck, chin and brow, and improves lines and wrinkles on the chest. Ultherapy uses time-tested ultrasound energy to lift and tighten the skin naturally—without surgery or downtime. The procedure delivers focused ultrasound energy to the skin’s foundational layer triggering a natural response under the skin, jumpstarting the regenerative process that produces fresh, new collagen. Some patients see an initial effect right after their treatment, but the real results appear over 2−3 months as new collagen works to lift and tighten skin on the neck, chin and brow as well as smooth skin on the chest. Thermage is a safe, non-invasive FDA approved procedure that's clinically proven to tighten and contour your skin. Its unique deep-heating radio technology used radio frequencies to stimulate and renew your own collagen, resulting in tighter, smoother skin. Over the following few months, this kick-starts the growth of new collagen resulting in a tighter, smoother skin and a more youthful appearance. Dr Rakus has received the Solta Black Diamond Award for her Thermage treatments and the Dr Rakus Clinic is one of the busiest Thermage clinics in the world! BTL’s Exilis is a revolutionary non-invasive treatment for the reduction of wrinkles as well as for the reshaping of targeted fat deposits. Amongst it’s various benefits it provides fast and effective skin tightening, with visible results often after the first session. Virtually any area can be treated thanks to the precisely engineered applicator. Dr Rakus was recently presented with the BTL Aesthetics Outstanding Contribution to Aesthetic Medicine by Lee Boulderstone, UK MD of BTL. Dubbed the radio frequency facelift, this non-invasive treatment utilises a new radio frequency technique to smooth wrinkles, and tighten and lift the skin, defining next-level anti-ageing results. Radio frequency current is one of the best non-invasive tighteners available and the well-established technique works effectively to push electrical currents through the skin. However Intracel is different as it utilises FRFM (Fractional Radio Frequency Microneedle) Technology™, a unique system to deliver electrical current actually into your skin for a radically enhanced effect. The Pelleve Wrinkle Reduction System is a safe and effective non-surgical facelift. Unlike other skin tightening procedures, the Pelleve Wrinkle Reduction System does not require skin cooling, the use of drugs or anaesthetics. Because your skin is not numb you can describe the depth of feeling to the doctor, which helps provide the best results possible in the area being treated. The Pelleve Wrinkle Reduction System precisely delivers energy to the dermal tissue using advanced radio wave technology to induce collagen contraction without damaging the epidermis. A Pelleve eye treatment can be as quick as 15 minutes, a full face can take as little as 45 minutes and with no downtime, it is the perfect lunch break treatment. The result is a noticeable improvement in skin quality and appearance. Dr Rakus has been awarded the Pelleve Glide-Safe Award in acknowledgement of her outstanding achievements with this treatment. TotalFX is a laser resurfacing treatment to improve and remove the unwanted cosmetic imperfections that can appear on our skin at all stages of life and include wrinkles, scars, brown spots and more. TotalFX offers immediate wrinkle reduction as the skin resurfacing technique induces collagen formation and tightening of the skin. You see immediate results that will continue for up to six months due to this new collagen formation. We also offer an exclusive treatment, 'The Angel Lift' designed by our clinician Mr Kambiz Golchin which combines Total FX laser treatment, with Platelet Rich Plasma (PRP) injections, stem cells and a Fat Graft. Complement your non surgical facelifting treatment with other treatments available at the clinic. From award-winning body contouring treatments such as Coolsculpting and the latest cellulite busting BTL Unison treatment, to amazing skin rejuvenation treatments like fraxel, as well as facial fillers and lip enhancements. The Dr Rakus clinic located in London’ Knighstbridge opposite Harrods is recognised worldwide as a centre of excellence for aesthetic medicine. 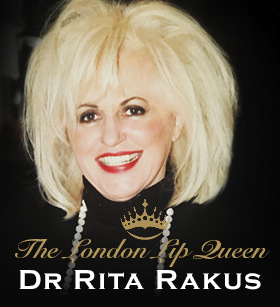 Dr Rita Rakus MBBS FBACD FBCAM is a multi-award-winning practitioner in the field of Cosmetic Medicine, widely known in the media as the 'London Lip Queen'. 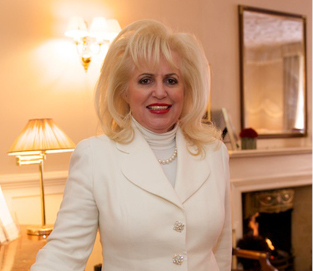 With over 25 years experience Dr Rakus travels all over the world treating an international and celebrity client base as well as attending seminars and visiting cutting edge practices to ensure her clients are offered the very latest proven treatment . She has also invested consistently in the latest technology too and her clinic is home to the UK’s most comprehensive range of treatment machines for facial rejuvenation and body contouring. As well as countless other awards, she was recently appointed as Global Key Opinion Leader for BTL Aesthetics for their treatments including Exilis, Wriggler, Unison, Lymphastim, Vanquish, EMsculpt and EMsella.